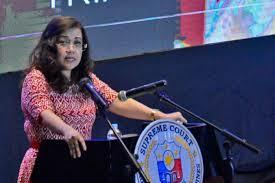 Chief Justice Maria Lourdes Sereno confirmed that she has no plans to run for the senate in the 2019 mid-term elections. According to her spokesperson, that the top magistrate is focused on her issues pertaining to impeachment complaint and questioned missing SALNs. The chief justice, who is on an indefinite leave from the Supreme Court, has been traveling around the country to deliver speeches on the independence of the judiciary, occasionally speaking out against the removal bids against her.